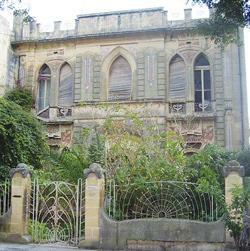 Roseville is an early 20th century house built as a residence by the proprietor Dr W. Briffa. The house was built in two phases; the ground floor was built in 1912 by architect Alessandro Manara and the first floor was added in 1921 by architect Emanuele Borg in the same architectural grammar of the ground floor. The Art Nouveau style of this house is locally a unique example and is also one of the finest and earliest examples. This house is complete and authentic in all its elements such as the architectural fabric, the decorations, including its fixtures and fittings. The type of Art Nouveau motifs of this building indicate a French or North Italian stylistic influence. Apart from the stylised organic motifs on the façade, this is the only building in Malta where polycromy was used on the façade, such that the recessed panels were painted red, while the motifs were picked out in other colours, thus accentuating the relief and creating contrast. Mepa scheduled Roseville as a Grade 2 national monument as per Government Notice number 492/06 in the Government Gazette dated June 6, 2006. The restoration of Roseville is in hand following the approval of a planning application and a restoration method statement.